A NASA researcher is studying the strange effects of artificial gravity on humans. February 7, 2003: Want to know what 3-g feels like? There's a circular ride there that spins dizzyingly fast. Standing inside it, your back is pressed against the wall. It spins faster and faster until, suddenly, the floor falls away. But you don't fall with it. You remain in place, pinned to the wall by forces "as great as 3-g -- or three times the normal force of gravity," says Malcolm Cohen, chief of the Human Information Processing Research Branch at NASA Ames. 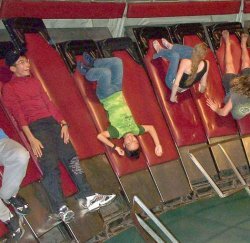 Right: Teenagers are pinned to the wall inside a spinning carnival ride called "the Gravitron." Image credit and copyright: David Burton. During the past few summers, Cohen has been spinning research subjects in something far more impressive than a carnival ride. He's been studying engineers, mountain climbers, teachers and other paid volunteers as they live for up to 22 hours in a giant, 58-foot diameter centrifuge. His goal? To learn how humans adjust to changes in gravity--particularly strong gravity. NASA is interested because it's not just microgravity that astronauts experience in space. They're exposed to hypergravity, too: up to 3.2-g at launch, and about 1.4-g on reentry. "Under these conditions," Cohen points out, "fluid weighs more." The heart has to change the way it operates, pumping faster, and working harder to push the blood all the way to the brain. This could cause astronauts to become dizzy or even, in extreme cases, to pass out. By spinning people in his centrifuge, Cohen hopes to learn whether the heart's response can be conditioned. Perhaps if astronauts were exposed to controlled doses of hypergravity before launch or reentry, then they might be able to tolerate high g forces better than they otherwise would have. An easier ride to space is not the only potential benefit. Here on Earth, hypergravity could be used to train athletes, providing an environment in which exercises could be conducted with more benefit in shorter time. People who suffer from muscle atrophy might be exposed to it, to stress their muscles more effectively. Centrifuges could be key to long-term space travel, too. That's because microgravity causes the body to deteriorate in a multitude of ways: cardiovascular deconditioning, loss of muscle mass, loss of bone density, and a host of other problems. Artificial gravity could prevent all that--and centrifuges are one plausible way to generate artificial gravity. The participants in Cohen's study have to be less than 5'8" tall--that's because the outer dimensions of the centrifuge cabin are only 7'7" deep by 5'11" wide. "With its padded walls, the subjects barely have enough room to lie down on the cabin's built-in cot," he explains. The cramped cabin is outfitted with a toilet, a TV, and a laptop loaded with computer games, tests and questionnaires. While they're spinning, participants answer questions about stress, fatigue and motion sickness; they perform complex reasoning tasks; and their vital signs, head movements, and general activity are monitored by sensors and cameras. "Artificial gravity is a potentially useful tool," notes Cohen, "but it's not a universal panacea." The force generated by a spinning centrifuge is not exactly the same as gravity, he explains. If you have a small centrifuge--say, one that might fit in a spaceship--you have to spin it pretty fast to create g levels high enough to be effective. But there's a problem: across the radius of a small centrifuge, g levels change rapidly. "Suppose you're lying on a short-radius centrifuge, with your head near the center, and your feet at the outside, and suppose you have 1-g at your feet. Your head would feel only about 0.2-g, or even less." That's not quite what you would experience in Earth's gravitational field! Rapid spinning creates another concern: if you move your head too quickly while you're inside a fast-moving centrifuge, you might feel uncomfortably like you're tumbling head over heels. This can happen when balance-sensing fluids in the semicircular canals of your inner ear become "confused." Some experiments using centrifuges often include devices that fix the subjects' heads in place, just to prevent that illusion. Traveling through space, however, with your head fixed in place is not practical. Right: The anatomy of the inner ear. 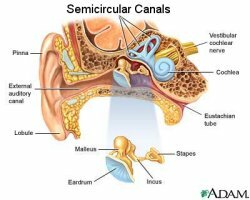 Fluids in the semicircular canals are crucial to human balance. Perhaps engineers could develop a centrifuge with a radius of several kilometers, large enough to generate high artificial gravity without rotating fast enough to trigger the tumbling illusion. Rather than using small onboard centrifuges, space travelers might slowly rotate their entire spaceships instead. Alternately, perhaps subjects could be taught to adapt to a rotating environment. The brain is unaccountably good at interpreting strange sensations after they're been around for a while. Witness the way astronauts can be disoriented when they first arrive in space, but soon learn to function in a weightless environment. If humans are spun for long enough, says Cohen, the strange effects of rotation might become familiar. Left: This artist's concept of a rotating spaceship en route to Mars was created by John Frassanito & Associates, Inc. See also a 300 kb Quicktime version of this scene. For now, though, Cohen is still trying to determine how different kinds of activities done in hypergravity affect cardiovascular conditioning. Cohen found that his centrifuge riders spent a lot of time lying down, in part because it was more comfortable, and in part because spinning made them drowsy--an effect called "the sopite syndrome." Cohen noted that he was surprised at how strong it was. Going forward, he'd like to examine what happens when they perform a range of predetermined activities, such as standing, in which the g-force places more stress on the heart. Much more research remains to be done. "There are so many options for how best to implement hypergravity most effectively," says Cohen. "Low intensity for long durations, high intensity for short durations, short radius centrifuges, rotating an entire spaceship." We know a lot, he says, but there's much more to learn. It is, after all, a weighty subject. 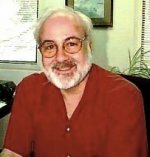 NASA Ames Perceptual and Behavioral Adaptation Group -- Malcolm Cohen is the group's principal investigator. 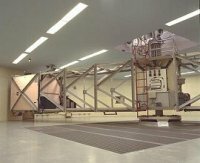 Right: Another picture of the 20-g centrifuge at NASA Ames. To produce a centrifugal force of 2-g, the centrifuge spins about 15 revolutions a minute. The Ames Digital Image Library for Life Sciences contains many more pictures of this centrifuge and others. The human balance system can become confused inside a spinning centrifuge, resulting in sensations of tumbling and loss of coordination. Another unwanted side effect of spinning is the sopite syndrome. Sailors experience it, too, because it is related to seasickness. Persons affected by the sopite syndrome feel tired and drowsy. Want to experience hypergravity yourself? Find a carnival or amusement park and take a ride on a Gravitron. Join our growing list of subscribers - sign up for our express news delivery and you will eceive a mail message every time we post a new story!! !